Lots of assassins’ fans are anticipating the launch of two new instalments in the series - AC Unity and AC Rogue. In addition to that, Ubisoft has prepared another pleasant news for them. Although, this information rather concerns those players who aren’t familiar with any of the games in this franchise yet, but are willing to try them. As you remember, last week, several online shops at once announced the pre-order of the new Assassin’s Creed collection, which contains the previous projects of the series. Then, Ubisoft didn’t give any comments regarding such news. But yesterday, the information mentioned above was confirmed. In the studio’s official blog, a post, which arranged everything back to order, appeared. According to it, the new Assassin’s Creed collection will include three games: AC III, AC IV Black Flag and AC Liberation HD. But it’s still unknown if it’s going to contain all the DLCs. “Ubisoft is offering Assassins fans a chance to catch up on the three previously released games set in the Americas”, - the company’s communications manager - Gary Steinman - has stated. The Assassin’s Creed collection will hit PS3 and Xbox 360 in North America on October 28th. It will have a title of The American Collection. 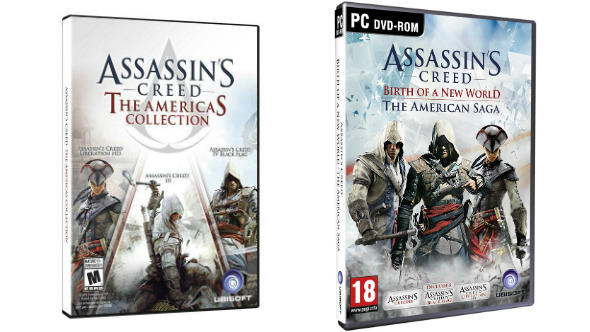 Besides the console versions, the European gamers will be able to appraise this edition, however with the other subhead - Birth of a New World - The American Saga, - on PC also on October 3rd. Let us remind you that the release of the next parts in the series will take place on November 11th and 13th.